There are no guarantees but it doesn’t mean that what you eat and how active you are doesn’t matter. There was an interesting book that came out a few years ago called the Blue Zones. Researchers were trying to figure out what certain groups of people were doing to live so long. They identified 5 places in the world with the highest life expectancy, or with the highest proportions of people who reach age 100. Here are 2 of them. “Hara hachi bu” – the Okinawan, 2500-year old Confucian mantra said before meals reminds them to stop eating when their stomachs are 80 percent full. The 20% gap between not being hungry and feeling full could be the difference between losing weight or gaining it. People in the Blue Zones eat their smallest meal in the late afternoon or early evening and then they don’t eat any more the rest of the day. Again, nothing new. Most of us know we eat too much. I remember hearing this same advice several years ago at a Health Event held in our City that was focusing on Brain Health and Preventing Dementia. “Eating Less” was one of their main points. Eating a Plant Based Diet is nothing new either. It just takes a little more planning and preparation to include more of these in your diet. I encourage you to plan then make at least one plant-based meal per week. Include beans. Try a new vegetable. If you are new to my blog I encourage you to look around. I have lots of recipes for you to try. Start the meal with a big salad. Enjoy time around the table by slowing dinnertime, one course at a time. Wash then Chop 1/2 cucumber, 1/2 each of a red, orange and green pepper, 1 green onion. To Caramelize 1/2 cup raw pecans you will need 1/2 tablespoon butter and 1 tbsp brown sugar. Melt butter in small frying pan over low heat. Add pecans and brown sugar. Cook 2-3 minutes, stirring constantly until mixture is caramelized. Spread out on wax paper or a plate to cool. 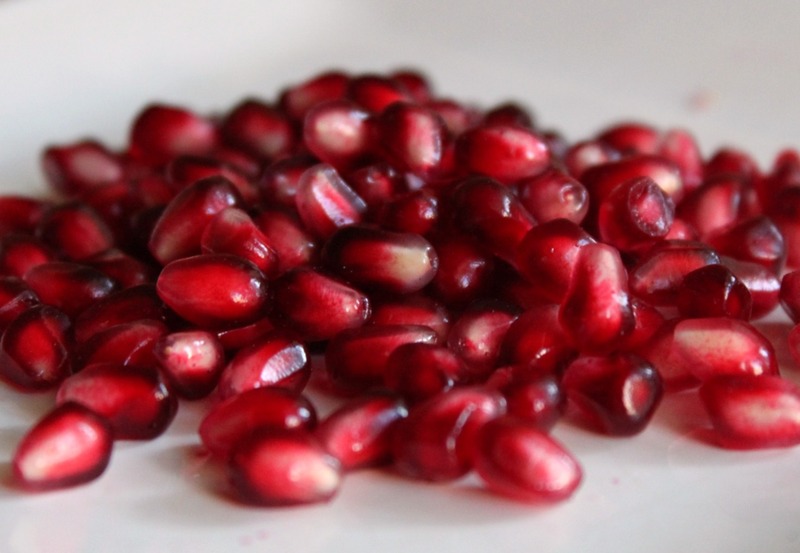 Remove the red delicious seeds from a fresh pomegranate. If you haven’t done this before it’s pretty easy, just a little messy and tedious. First cut the pomegranate in half, then pull each half apart again with your hands. Then pick out the seeds with your fingers. So worth it! You could substitute sliced pears or oranges but you would really being missing out! Mix this all together in a large salad bowl together with a small amount of feta cheese. The cheese is really just a garnish in this salad so a tbsp or 2 is plenty. Add only enough dressing to lightly dress the salad. Eat slowly. Enjoy the distinct flavors. I wish you boundless energy. I hope you feel great every day! To be honest there is not alot NEW in the area of Healthier Living. The conversations about what’s healthy and what’s not are still happening with little change really being made. We are creatures of habit and change is hard but not impossible. It won’t happen overnight just like whatever health challenge you are facing didn’t happen overnight. Too much stress, too little exercise and years of not really thinking about what we are putting into our bodies and of those we love won’t change overnight. We are more than a week into 2014 and if you’ve resolved to do something about living healthier don’t give up. What’s not new is that we need to GET MOVING. Our bodies were built to move! 150 minutes per week, 30 minutes 5 times per week for adults and 60 minutes per day for kids over the age of five is the bare minimum. According to Statistics Canada released in 2013, only 15% of adults and 6% of children meet these targets! Try something new like snowshoeing. It is aerobic and fun. In a large pan, heat the oil and saute the onion and garlic for a few minutes until soft. Add the tomatoes, beans and tomato paste and simmer for 10 minutes, until the sauce thickens. Stir in the pesto if using. Cook the pasta until al dente, drain reserving 1/4-1/2 cup cooking liquid. Toss with kale, beans & mozzarella in a large bowl. Stir in hot tomato sauce which will slightly wilt the kale. Pour into a large baking dish or 2 if needed and sprinkle with grated romano. Season with fresh ground pepper. You can cover and refridgerate overnight, freeze or bake now at 350 for about 30 minutes until bubbly and golden. Garnish with torn basil leaves. Serve with a side dish vegetable like steamed carrots or broccolini and a salad. Posted in Eat Your Greens, Salads and More, Get Moving, Health Matters, What's for Dinner? You know that the transition to shopping and cooking for 2 has not fully been embraced when icecream is left on the dessert plate. Served together with a delicious first time recipe “Pear and Hazelnut Cake” the icecream was inedible tasting like the ‘freezer”. A quick survey of my freezer, pantry and refrigerator revealed that I am still buying in “bulk”. I’ve decided that my efforts to buy less since there are less mouths to feed really hasn’t tranlated into reality yet. I have been cooking less in terms of portions always having some leftovers in the freezer for the day I come from work and don’t feel like cooking but I still have way too much food in the house. Truth be told, some gets wasted and thrown out because it is stale, has mold growing over it, is out of date or “tastes like the freezer”. I have a plan. I need to start meal planning again. Meal planning helps reduce waste because I shop from the plan and cook from the plan. It doesn’t have to be complicated. I usually only meal plan supper though when making my grocery list I add the staples that I know fit into breakfast and lunch. So this week this is what I planned…Monday- Black bean Quesadillas with guacamole and applesauce on the side. Tuesday– Red Lentil, Sweet Potatoe/Carrot Curry with Coconut milk and Green Peas, served with Sprouted Brown Rice and Naan Bread. Wednesday– Leftovers. Thursday– I am going to try a new pasta dish with whole wheat fettucini, a simple sauce made with olive oil, ground almonds, basil and garlic from Jamie Oliver’s Italy cookbook and serve it with steamed asparagus, broccolini, toasted garlic bread and a caesar salad. Friday– Vegetable Stir Fry including carrots, cabbage, onion, celery and Kale with Sweet and Sour sauce, tofu marinated in soy sauce, sesame oil and sesame seeds served on a bed of Sprouted Brown Rice and topped with sunflower sprouts and lightly toasted raw cashews. Saturday– Work Christmas Party. Sunday– Red Pepper and Onion Frittata served with a large side salad with walnuts, sliced pears, cranberries, avocado and shaved carrot topped with Olive oil and Balsamic vinegar dressing. That’s it. Most of what I planned for this week’s menu was taking into account what I already had in the refridgerator, pantry or freezer. All I needed to buy this week was lettuce, red peppers avocados and a few breakfast and lunch staples. Cooking for 2 has not been that hard but shopping for 2 has proved to be more of a challenge. Always mindful of getting “the deal” buying in bulk has been the standard. I have been known to say more than a few times that ” a deal is not a deal if you don’t need it“. That same line could be applied here where ” a deal is not a deal if it ends up in the garbage”. Bulk buying is going to be a thing of the past for me. I am going to stick to buying only what I need for the week, limiting even what I “stock up”. I may even have to shop more than once a week. There is still lots to buy local. Check back to see what is still available at our local Farmer’s Market! You will be surprised. Combine the flour, salt, baking soda and nutmeg into a bowl. In a separate large bowl, whisk together the oil, soy milk, vanilla, lemon juice and maple syrup. Add the grated pear and stir well. Pour the wet ingredients into the dry and mix together with a fork gently, do not beat. Pour the batter into an oiled 8 inch springform pan. Sprinkle the topping evenly over the cake batter and then arrange the pear slices around the edge of the cake in a circle. Bake in a preheated oven for 40-45 minutes. Test with a toothpick being sure it comes out clean. Cool slightly then remove from springform pan onto a cake serving plate. Serve still warm or cold with a scoop of your favorite vanilla iced dessert. Enjoy! There is nothing better on a rainy or snowy day than a big bowl of soup or my new favorite pasta dish. Comfort foods that are healthy, satifying and delicious are not hard to make. Add a thick slice of your favorite whole grain artisan bread and a either a salad or another new favorite vegetable as an appetizer and you are set to go. I can spend hours perusing the aisles for olive oil, balsamic vinegar, all shapes and sizes of pasta, fresh olives and the huge variety of quality cheese perfect for garnishing pasta dishes. I stumbled on a pasta and beans recipe that is the perfect comfort food. I hope you enjoy it. In a medium pot heat the olive oil of medium heat and sauté the onion, garlic, carrot and celery until soft, about 5 minutes. Drain and rinse the beans and add to the pot along with the stock, tomatoes and oregano. Simmer for about 10 minutes with the lid on. Add the pasta and simmer for another 10 minutes or more until the pasta is tender. If the mixture is too thick add a little extra stock or water. It should be thick but soupy. Season with pepper and grated cheese and serve hot. I served it this week with roasted brussel sprouts as an appetizer. These used to be my husband’s most hated vegetable and much to my disbelief and even his own we almost have to “count” them out now to be fair. :) I wash and cut in half about a half pound of brussel sprouts. Toss them in a tbsp of olive oil, 1 tbsp nutritional yeast and fresh ground pepper. I then roast them in our toaster oven at 400 degrees for about 20 minutes. Then top them with some freshly grated parmesan or romano cheese and eat hot. I dare you to try it! Posted in Recipes, Soups Can Be A Meal, What's for Dinner? It really feels like it this week. Back to school week. No more back to school jitters, no more back to school shopping, no more thinking about lunches. Where did the time go? Not sure why it has hit me more this week because really, it’s been over 2 months since the last wedding and the final exodus. The bedrooms have been switched over, one is now our exercise room, complete with a pull up bar. The other is slowly being decorated as an official guest room. “Their” bathroom has been clean for 2 months now. The dining room table is set with candles and flowers instead of binders and books. I love coming home and finding the house exactly how we left it, especially the kitchen. The leftovers are still in the fridge, the ones I planned to reheat for dinner or take for lunch. I love the quiet, YET I miss the noise. I miss hearing all about their day at school, the latest story from work, the smell and taste of Rachel’s homemade cookies and Kirsten’s latest Thai stir fry even though every cooking utensil was used. I miss their infectious laughter and wiping away their tears. I knew it would happen one day, and that day has come. I’m thankful that we have a made a point of building into our marriage. We have made good friends with common interests and have stuff to talk about and do. We are looking forward to this next phase, doing life together as emptynesters and making new memories with our daughters and new sons. Speaking of leftovers, I made this recipe last night for dinner and we both enjoyed the leftovers today. I usually serve it with a piece of naan bread and at this time of year, fresh corn on the cob. Enjoy! In a large skillet heat a glug of olive oil over medium-high heat. Add the cumin seed and cook for a minute or two, until wonderfully fragrant. Add the onion and cook until soft and starting to turn golden, about 3-5 minutes. Add the jalapeno, cilantro, ginger and curry and cook for another minute, then add the tomatoes, chickpeas, and half the can of coconut milk. Add in the fresh green beans if using and bring to a simmer. Cover and cook for 5-8 minutes until everything softens and thickens. Add the rest of the coconut milk if you like it saucier (yummy for dipping naan bread) Stir in well and add frozen peas or spinach and cook another 1-2 minutes to heat (peas) or wilt (spinach). Serve hot over brown rice. Posted in Recipes, What's for Dinner? The best Thai Soup Recipe..
My friend Eunice found this one. When it comes to spicy her family likes it hot. My family likes some heat but not so much that you can’t feel your lips:) You will need to have a few items in your pantry that you might not normally stock but so worth it! They have been staples in our house for awhile now. Check out my “pantry” list for details. I made this soup last week. 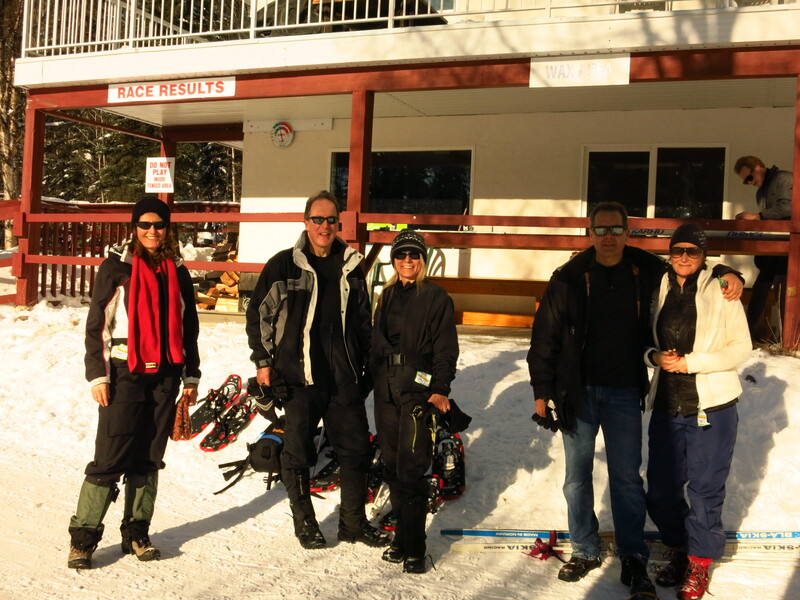 It really hits the spot after snowshoeing or X-country skiing or any other winter outdoor activity. We have another month at least of winter. Don’t rush away the days, embrace them. Get outside , get moving… and before you go out, make a double batch of this soup. You will be glad you did. Yum! Cook rice and set aside (or use left-over cooked rice). Heat large saucepan or Dutch oven over medium heat and add 1 Tbsp. oil. When hot, add mushrooms and cook until golden and tender. Remove to a plate. In same pot, add remaining 1 Tbsp. oil and heat. Add onion, red pepper, (if using carrots or bok choy add here)and saute just until softened. Return mushrooms to pot. Add broth and heat through. Add lemon grass paste, fish sauce and Worcestershire sauce and simmer 5 minutes. Add coconut milk, turn heat to low, then cover and simmer 2 minutes. In a small bowl, add curry paste, Sambal Oelek, tomato paste, 2 Tbsp. water and cornstarch and mix until incorporated. Stir into soup until combined and heat until soup simmers, thickens very slightly and has a velvety appearance. Add cooked rice, cover and simmer 5 minutes. (You can also add more curry paste, tomato paste and/or Sambal Oelek to taste at this point, as well). Pour soup into bowls and garnish with cilantro, parsley or basil leaves and serve with additional Sambal Oelek for those who prefer a hotter soup. Posted in Soups Can Be A Meal, What's for Dinner?